Update: now read our Hands on: HTC Wildfire S review. A smartphone for those on a tight budget, the HTC Wildfire doesn't skimp on the specs; the touchscreen handset runs Android 2.1 with the user-friendly HTC Sense UI and is rocking the same processing power as 2009's phone of choice, the HTC Hero. We'll be running this review a little differently – HTC gave us three phones to test rather than one, so in addition to the main review we've got TechRadar readers Paul Jones (PJ) and Dennis Shorter (DS) to give their two penn'orth. PJ: I'm an HTC Tattoo user, so it's hard not to compare the Wildfire to it the whole time I've been using it. The good news is it seems to be much better. DS: I've not been a fan of HTC since I was forced to use the HTC Touch Diamond for work – the stylus and convoluted user interface was a real turn off. Having not touched an HTC product since then, I'm glad to say that the new range appears to be a lot more user-friendly. The 3.2-inch QVGA capacitive touchscreen and optical trackpad work in tandem for easy navigation, while the 5-megapixel camera will keep photographers happy even in the dark, thanks to the inclusion of an LED flash. Gone are the toy-like looks of its predecessor, the HTC Tattoo – the Wildfire has a more mature style in the vein of its older sibling, the HTC Desire. Although small in stature, the Wildfire sill towers over the likes of the Sony Ericsson X10 Mini. HTC has gone all-out on the social networking features for the Wildfire, integrating Facebook into everything from the calendar to caller ID. Sharing Android apps has also been made simple with a system for sending links to friends from the handset. Everything is nice and compact, much like the handset itself. The HTC Wildfire is small and light; at 118g it weighs in at just 20g more than the Sony Ericsson Xperia X10 Mini – a tiny, tamagochi-sized handset. Thankfully, the screen is quite a bit larger – 3.2-inches of capacitive touchscreen goodness. If you're accustomed to a smartphone with a larger screen, you may find yourself missing the extra inches, though. The rather more cramped Home screens of the HTC Wildfire, when compared to the iPhone or HTC Legend, began to grate after a little while, and those with larger fingers may struggle to make the appropriate selections. When it comes to looks, it's hard to be disappointed by the HTC Wildfire. Taking its design cues from the HTC Desire, it features the bold silver highlights and optical trackpad, and is a world away from the other budget Android handsets we're starting to see invade the market like the cheesy hipster looks of the Motorola Flipout or the sombre plasticky LG GW620 InTouch Max. 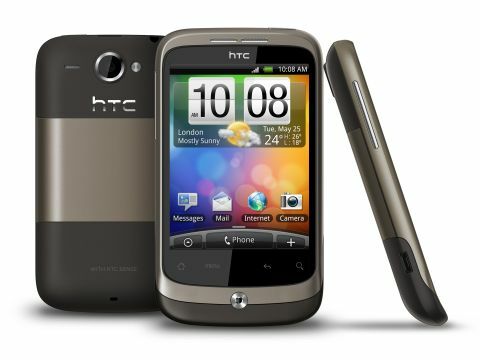 Available in a variety of colours – from jolly cerise to serious bronze – the HTC Wildfire looks grown-up and feels solid in the hand despite its lightweight disposition. It's great to see that some thought has gone into the camera – with an LED flash sitting next to it and a smart silver rim, the camera lens looks quite the business. The optical trackpad doubles as the front panel's only button; other commands are controlled by touchpads at the bottom of the touchscreen panel. Unfortunately, HTC has not seen fit to give the Wildfire the camera button we so deeply desire, so the optical trackpad doubles as shooter too. The handset does have the one-button volume control on one side though, and the HTC Wildfire's power/screen-lock button sits on the top of the handset alongside the 3.5mm headphone jack. It's all very straightforward and no-nonsense. PJ: The HTC Wildfire looks really good; it feels much more professional and sophisticated than the Tattoo ever did. I really like the minimal number of buttons but I miss having a physical call and hang-up button. However, the layout redeems itself by making it harder to accidentally unlock the Wildfire in your pocket as only the power button can do it. It's not just the buttons that impressed me, though; the HTC Wildfire's screen is really nice too, especially compared to the Tattoo. It's smooth to use and the resolution is so much better than that of the Tattoo. DS: The HTC Wildfire looks a little squashed down when you first handle it – not ridiculous though. I'm not a fan of the touch sensitive buttons, as I can never work out where I'm supposed to be tapping without looking – it's easy to get confused. However, the Wildfire is pocket friendly and feels good quality for the price. HTC doesn't mess about when it comes to accessories. As such, the HTC Wildfire comes with the minimum – but it's the quality not quantity that we like. Why get tangled up in two wires when one will suffice? Hence the multi-part charger, the wire of which doubles as USB connector. The Wildfire also comes with headphones; smart black earbuds with a 3.5mm connector and hands-free capability.